When I received my first moldavite, I wire wrapped it and began wearing it as a pendant. Day one: I felt like I was experiencing a lot more clarity and was able to concentrate more easily. That night I had vivid dreams that gave me insight into a problem I was experiencing. Day two: I have been going through a difficult time financially with starting a new business. A family member contacted me and offered to pay my rent for the month. It seems that this stone helps to serve one’s highest path, increases clarity, it’s energy cleansing, and it throws you onto a whirlwind path of activity that helps you reach your goals faster. Unfortunately, the moldavite slipped out of my wire wrapping while swimming. I am definitely in need of a new one! I am highly susceptible to the effects of energy via gemstones etc. 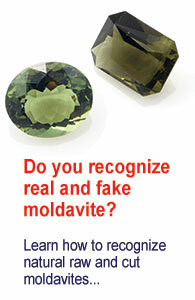 I have another friend who has a moldavite and she experienced a rapid change in her life. It’s really awesome and I hope to replace mine soon so that I can get on that wavelength again!